In one of the most exciting games of the Turkish Airlines Euroleague season, Brose Baskets Bamberg advanced to the Top 16 for the first time since 2006 by edging Partizan mt:s Belgrade 92-90 in overtime in a make-or-break battle for fourth place in Group D on Thursday. Brose finishes fourth in Group D with a 3-7 record, while Partizan is sixth at 2-8. The guests needed to win and for Besiktas JK Istanbul to down Lietuvos Rytas. When Besiktas won 66-65, the game turned into a do-or-die showdown for fourth place, in which Brose prevailed. 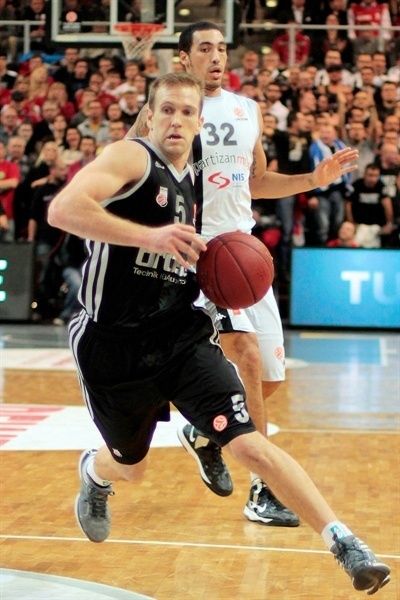 Bostjan Nachbar paced the winners with 23 points. Anton Gavel added 16, Sharrod Ford posted 12 while Maik Zirbes and Casey Jacobsen each got 11 for Brose. Vladimir Lucic led Partizan with 19 points. Leo Westermann added 16 while Dragan Milosavljevic and Drew Gordon each had 14 for the guests. Gordon added 15 rebounds for a double-double. Brose led most of the way and held a 73-64 margin with seven minutes left in regulation. Westermann, Lucic and Milosavlejvic allowed Partizan to get a 77-78 edge with 30 seconds to go. Jacobsen and Ford gave Brose a 80-78 lead, but Milosavljevic drew a foul with 4 seconds left in regulation. He missed both attempts, but a put-back dunk by Gordon sent the game to overtime, 80-80. Once in the extra period, Nachbar, Ford and Gavel gave Brose a 92-89 lead, but Milosavljevic returned to the line with the chance to tie it. He missed his first and third attempts and could not hit an off-balance baseline shot at the buzzer. With a spot in the Top 16 at stake, both coaches made one change to their starting five from last week with Bamberg coach Chris Fleming sending out John Goldsberry instead of Teddy Gipson alongside Nachbar, Jacobsen, Anton Gavel and Zirbes. Partizan boss Dusko Vujosevic replaced Milosavljevic for Bogdan Bogdanovic while keeping Westermann, Lucic, Dejan Musli and Drew Gordon. Goldsberry got Bamberg on the board first with a jumper and Nachbar’s two foul shots made it 4-0. Westermann put in an offensive rebound for Partizan’s first basket for a 4-2 game. Bamberg pushed the lead to 8-2 on two Gavel free throws and a Zirbes layin before Milosavljevic knocked down a triple for the guests. The Bamberg advantage was back to 11-5 until Gordon scored for the first time. Partizan tried to use a zone defense but Goldsberry nailed a three-ball from the left wing and Jacobsen hit a fast break layup after a steal and assist by Zirbes, pushing the Bamberg lead to 16-7 and resulting in a Partizan timeout. Milosavljevic was on target for Partizan but Bamberg continued to roll offensively with a Nachbar three-ball, a Sharrod Ford dunk in traffic and extra free throw and Gipson jumper for a 25-10 cushion. Davis Bertans nailed a three-ball for Partizan as the first quarter ended with Bamberg up 25-13. Nachbar’s jumper opened the second quarter before Karsten Tadda swiped a steal for a fast break lay-up and a 29-13 Bamberg lead. Lucic converted a three-point play to finally get the guests on the scoreboard in the second quarter to make it 29-16. Nachbar nailed a three at the other end to re-establish a 16-point lead at the 8:40 mark. But then Bamberg just could not convert offensively. Westermann nailed a three and then rushed back after a Bamberg miss for an easy layup before a Lucic long ball brought the deficit down to 32-27. Westermann committed an unsportsmanlike foul, which resulted in a Goldsberry free throw and a Zirbes lefty hook for Bamberg’s first basket in nearly 5 minutes for a 35-27. Zirbes blocked Milosavljevic at the other end and Nachbar canned a jumper for a 37-27 lead. Gavel’s three-ball later increased the lead to 42-31 and Zirbes answered a Lucic dunk with an emphatic throwdown of his own before Nachbar’s big triple from the left corner for a 47 -33 Bamberg lead. Zirbes picked up his third foul with less than two seconds left in the half and Westermann picked up two foul shots for the 47-35 scoreline. Lucic’s free throw started the second half and Nachbar’s triple pushed the advantage to 50-36. 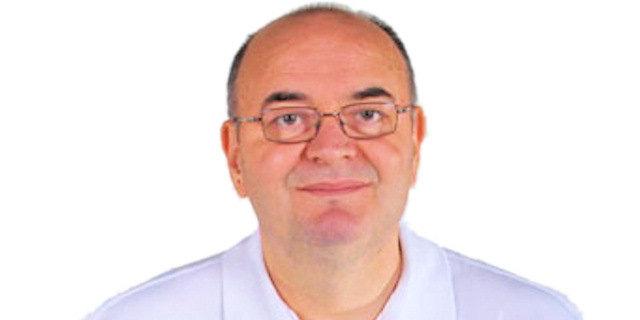 But Milosavljevic and Lucic both completed three-point plays – and both with fouls on Nachbar, sending the Bamberg star to the bench with four fouls with 7:44 remaining in third quarter and Brose up 52-44. Two Ford free throws increased the lead to 55-46. Bertans nailed a three-ball form the left wing but Jacobsen answered with a triple of his own to keep Brose Baskets ahead 58-49. 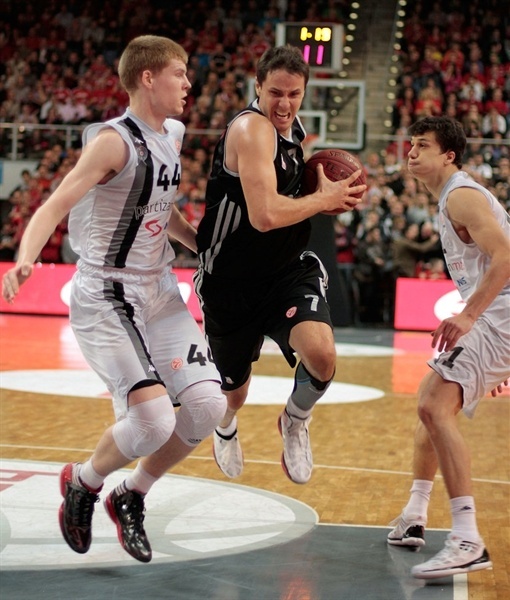 Bamberg could not pull away and Partizan would not lay down as Jacobsen’s free throws made it 63-55. Partizan twice grabbed offensive rebounds and Gordon converted both times to bring Belgrade to within 63-59. Lucic was called for a technical foul, resulting in a Jacobsen free throw and a Zirbes offensive rebound putback for a 66-59 Bamberg lead. 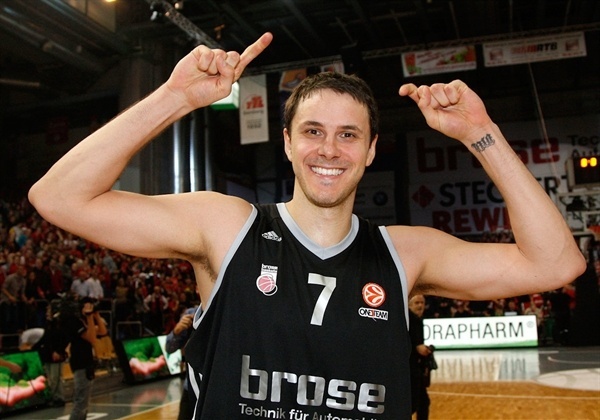 Nemanja Gordic nailed a three-ball before Gipson was on target for a 68-62 Bamberg advantage after three quarters. Zirbes’s pull-up jumper in the lane opened the scoring in the fourth quarter and Lucic’s foul shots had Partizan back to within 70-64. But Tadda nailed a three-pointer for a 73-64 Bamberg advantage and a Partizan timeout with seven minutes left. Westermann answered with two foul shots and Milosavljevic threw down a dunk after a Goldsberry turnover to cut the deficit to 73-68. And then Musli knifed down the lane for a layup before Gavel hit a driving layup to make it 75-70 and end a two-minute scoring drought for Bamberg. After a Lucic jumper to cut the deficit to 75-72, the game saw a great sequence with Ford blocking a shot by Westermann at one end, Nachbar missing a dunk and then Gordon blocking Tadda. Gordon came back down after a timeout and nailed a baseline jumper only to see Gavel nail a three-pointer at the other end to keep Bamberg ahead 77-74. Gordon made one foul shot and Milosavljevic made two to even the game for the first time since the opening tip at 77- 77. Gavel and Jacobsen both missed three-pointers for Bamberg. Milosavljevic and Bertans both missed treys for Partizan but Lucic grabbed two offensive rebounds and was fouled on the second, going to the line and making one of two free throws with 32 seconds left to give Belgrade its first lead of the game at 77-78. Nachbar missed a three-pointer with 19 seconds and Bamberg retained possession on a jumpball situation with 14.4 seconds remaining. Milosavljevic nearly stole the in-bounds pass and Bamberg had a re-do and Jacobsen was fouled with 12.6 seconds left, making the first free throw but missing the second with Ford tipping in the miss to make it 80-78. Milosavljevic went to foul line with 4.4 seconds left, missing the first and then purposing missing the second with Gordon getting past Nachbar for the offensive rebound and dunk to make it 80-80 and force overtime. 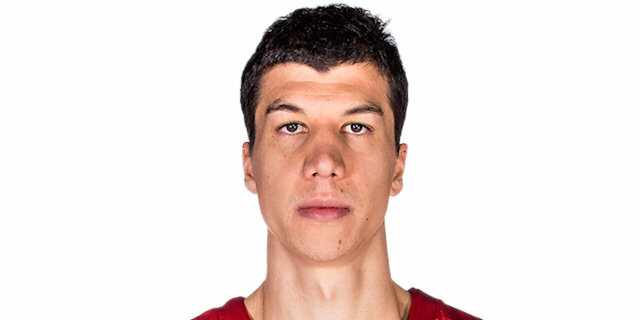 Milosavljevic split two free throws to start the overtime and Gavel answered with two foul shots to give Bamberg the lead. Westermann came down and nailed a long-ball but Gavel bounced right back with a driving layup to even it 84-84. Nachbar and Gagic both split two free throws before Nachbar’s two foul shots made it 87-85 with two minutes to play. Ford made one of two for an 88-85 Bamberg lead with 1:33 remaining. It was 88-87 after Nikola Milutinov made a long jumper with the shot clock winding down for his first points of the game. Milutinov then made two free throws to give Partizan the lead 88-89. Ford game back down for a dunk and then after a Belgrade turnover Gavel made just one of two free throws with 13.6 seconds remaining to make it 91-89. Goldsberry stole the ball and then made one free throw with 3.1 seconds left for a 92-89 lead. 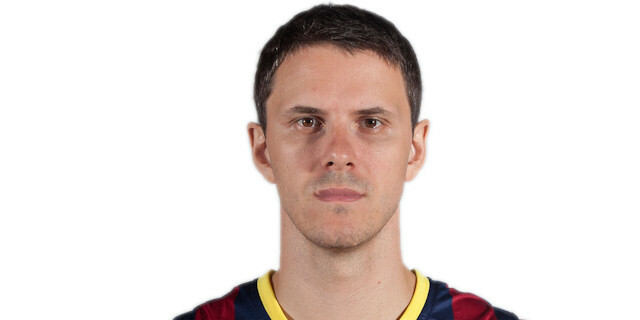 Milosavljevic was fouled with 1.5 seconds left for three foul shots, missing the first and making the second. And then Milosavljevic got the offensive rebound but missed a chance to send the game to double overtime. "I am pretty damn happy. It means a lot. It would have been tough to walk into the locker room and talk to those guys tomorrow. We had a lot of chances to put them away. But they kept coming back. In the end we deserve it. We knew that it would be a final and it was a real final. It was a real battle for both teams. At the end of the day, I am very proud of the guys who were here the last three years and just missed the Top 16. They really earned it." 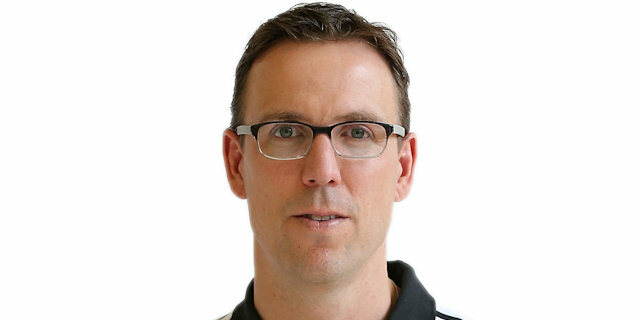 "I congratulate Bamberg for the victory and for advancing into the next stage. We knew that this would be a decisive game. Both teams had a lot of pressure. And you could see the heroism by both teams and their players. I am satisfied with the performance of my team. " "I think it goes without saying that it’s a huge win and a huge accomplishment for the city and this club. It feels extremely nice to be part of this. It’s special. For a lot of teams that made it to the Top 16, it’s just like any other season. But for people here, it’s something really special. As a player, I appreciate that and enjoy being part of that." "We had so many chances this season, three defeats in overtime. We only lost one or two games in a real way. What can I say? We gave all we could and it’s not a shame to lose this game. We just needed some small things here and there to make the difference. We had a lot of bad luck this season and we hoped it would come back for us. But tonight we didn’t score in the end. Our biggest problem was our slow start and their big lead. Because of that they won."